I'd like to share a catch on another trip around Ubin waters again. We caught quite a few fish this time, it was fun and frustrating at the same time losing quite a few fish to the Kelong stilts. We've got a tripletail too this time round, haven't seen it for quite a while. Why you go steal aunty's fish ? orh hor ... next time i go aunty's farm i tell her !! Beware of this black cat that come steal your fish right under the farm!! Haha, we weren't fishing at her farm but it's kind of tempting to do so when we were there to get some prawns. 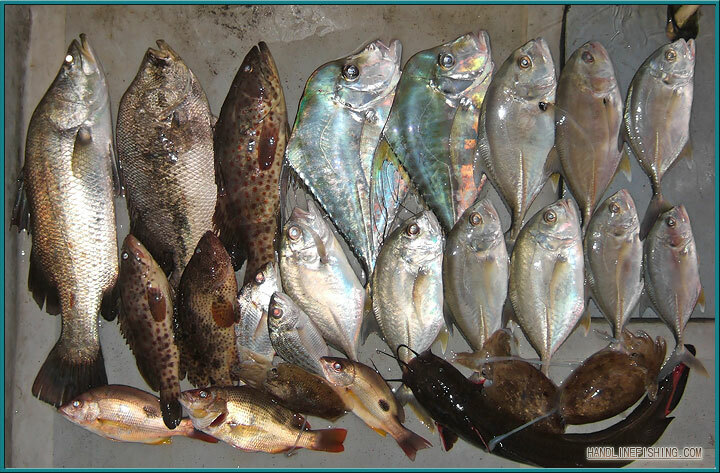 The smaller white fish is tat sagai? Those are small giant trevallies. I'm not sure if they're wild or not, but local fish farms do bred them. These trevallies are supposedly common in brackish waters too. Mangrove areas do harbour these fishes, places like johore straits have less water circulation from the open sea tend to have lower water salinity too.